I know, long time no seen. I haven't been blogging lately but like I said I don't favour blogging media-or-social-or-whatever news. There are so many sources out there already that I think it doesn't really make sense just to post a link to someone else's blog post and write a few paragraphs of same stuff. Plus, it seems like a blog concept is a little bit old for that anyway. Check, for instance, microblogging services like Twitter, Laconica or JS Kit Echo. FriendFeed or Facebook might be really good for that matter too. Depends on who you are friending with. Anyway, looks like this blog's getting more and more personal, a diary if you will. 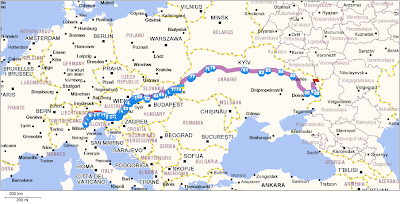 Here's the latest: I'm gonna be driving across a part of Europe (Italy - Austria - Slovakia) AND along Ukraine. It's about 3000 km, 38 hours of driving one way according to ViaMichelin but I think I'll make it in 2-3 days for I do want to make some stops and sleep a little bit. 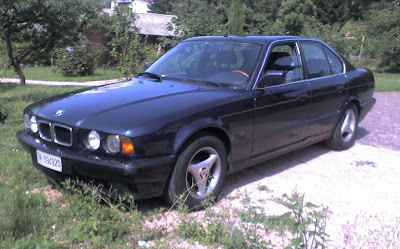 I'm gonna be driving my BMW 520i with widen tires, modified springs and a 200W subwoofer so, that should make it enough comfortable. I'm not sure yet which cities I'll be stopping by but I will certainly be publishing photos and videos. Plus, I think I'll stick a hidden front camera on my car as I'm really curious to what's gonna happen on Slovakia - Ukraine border. I've heard a lot of stories but never did it on my own. I'm taking off this Wed, 12 August, late evening so stay tuned for updates via twitter, facebook, friendfeed or this blog.